1844 – Rev. James Smyth of New Haven offers first Roman Catholic Mass to 6 Irish residents ( Nicholas Brockway, Daniel Brockway, Nicholas Cass, Patrick Gaffney, Thomas Gaffney and Daniel Quinlan) of Humphreysville at “old long house” on Raymond Street. 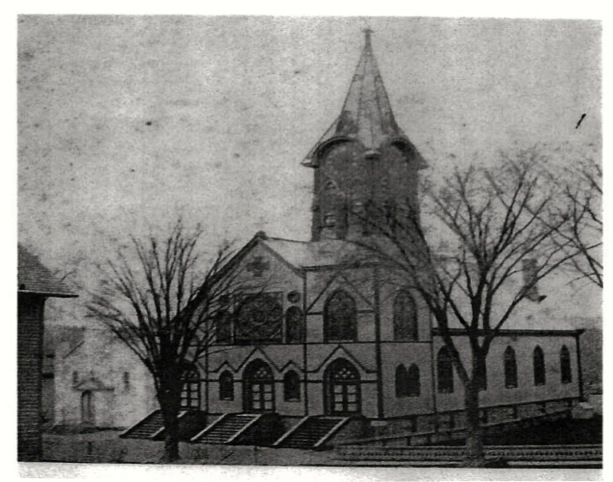 1856 – St. Augustine Church completed and dedicated. This is the present rectory. 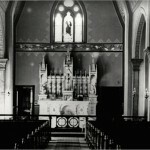 1885 – Parish elevated to status of being independent parish. Rev. John McMahon named as first resident pastor. 1886 – Rev. Richard C. Gragan appointed 2nd pastor. Debt of $1000 to build church is paid in full. Church is debt free. 5/4/1888 – Ground is broken for a new church and on July15th a cornerstone of a new and larger church is laid and blessed by Bishop McMahon. This new church was of wood and was 53 by 101 feet with a spire 118 feet in height. There were dials on the four sides ready for a clock to be installed. The seating capacity was 600 people. Cost of the new church was $13,000. 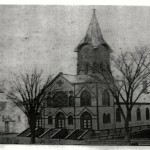 5/18/1890 – Formal dedication of new Church. The old church building is converted into the rectory. The congregation is a mixture of Irish, Polish and Germans. 4/01/1894 – Rev. Michael Rigney named as the third resident pastor until 1919. 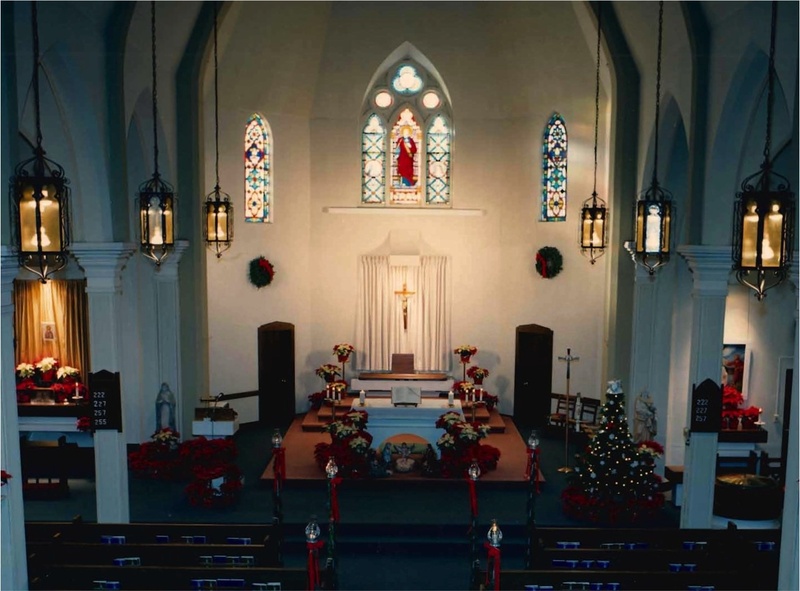 The Church basement is renovated and the cemetery improved.The Church population has grown and the parish is divided as St. Michael’s in Beacon Falls is built to accommodate residents from that area who are parishioners. 7/30/1910 – Rev. Charles A. Leddy appointed new pastor. New organ purchased. 1919 – Rev. Martin O’Brien succeeds to pastorate. Church interior completely refurbished. 1936 – Rev. William F. Casey becomes the seventh pastor of the parish.The church interior sees the installation of new altar, new lights, pews and Stations of Cross. The Sanctuary is enlarged and the tolling bell is removed from tower and the tower’s height is cut back. The church census now shows a greater influx of Polish and Slovak parishioners. 1957 – Rev. Callahan purchased property across from Church. Originally intended to be used as convent. 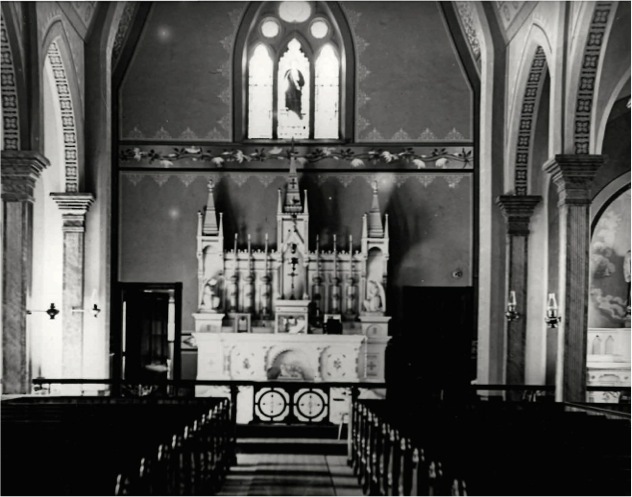 1967 – Congregation divided into 2 parishes – Church of the Good Shepherd formed on West side of town. 1968 – Rev. Bradford Colton named the ninth pastor (1968-1987). The Church interior is redecorated and the basement renovated. A handicapped ramp installed on the north side of the Church building. 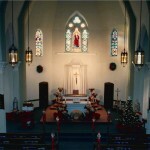 1999 – Major renovations to rectory, and parish center completed. 2009 – The exterior front stairs of the church are repaired and resurfaced at a cost of $16,000.